I love ice cream. Jodi has been busy making her homemade ice-cream lately and I’ve been trying my luck with some different frozen treats. Last week was the Limeade Pie. And if you’re a Trix fan, then this treat will be for you! The kids were playing downstairs when I was making this. So they will have a fun surprise after daycare tomorrow! I dislike getting or knowing about surprises for myself, but I love giving them. And kids love the little things like a fun frozen treat! 1 Line 8×4-inch loaf pan with foil, leaving edges of foil hanging over sides of pan. Divide condensed milk evenly between 2 medium bowls. Stir Key lime pie yogurt into 1 bowl. Stir strawberry yogurt into remaining bowl. 2 Spread Key lime pie mixture into foil-lined loaf pan. Sprinkle with cereal. Gently spoon and spread strawberry mixture on top. Freeze at least 8 hours until firm. 3 To serve, use foil to lift frozen loaf from pan. Pull back foil and remove. Let stand 5 to 10 minutes to soften slightly. Cut into eight 1-inch slices. Serve immediately. For some reason my strawberry yogurt portion didn’t seem as full as the key lime pie. But either way, I’m going to have a hard time going to bed knowing this is in the freezer setting for me to maybe try for breakfast!! Have a great day. Enjoy your weather no matter where you are reading from. Here’s the 3rd recipe that I’ve come up with for the avocados from SoCalAvocados. Avocado shake it is! So far every day now I’ve gotten at least one fruit that’s ripened. I have ideas in my mind for what I want to do but then I change my mind. I know it’s winter and it’s cold outside – or it should be anyways! And most don’t think of drinking something cold at this time of the year. But I did! 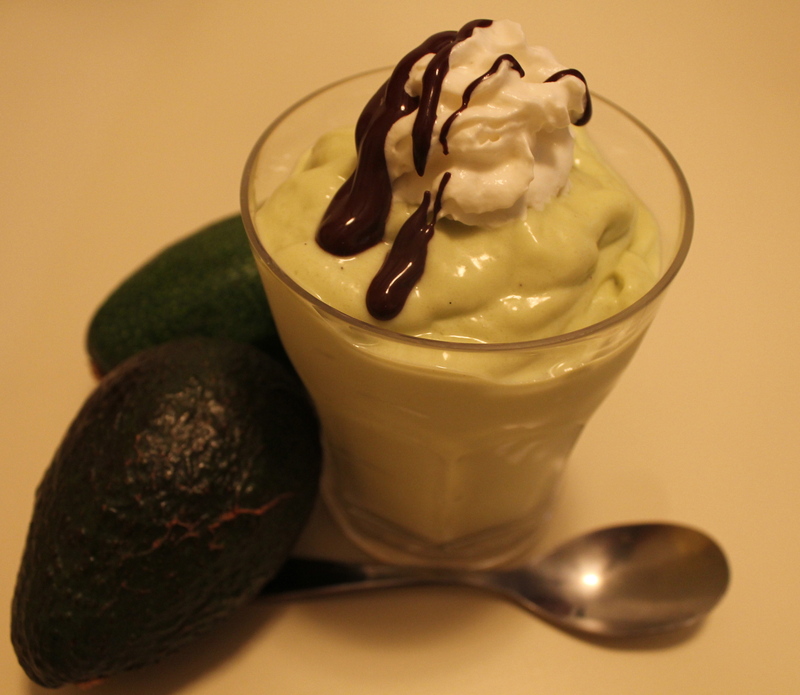 I tried to think of other fruits that I could combine with the avocado to make this shake, but decided if I did that it would take away from what the purpose of what the recipe is for….the avocado! This was another easy one to make. I didn’t have a blender on hand so I did have to run to the store to get one! Go figure! There are only a few ingredients needed for this shake. But what goes through your mind when you think of avocado shake? Have you had this before? If you haven’t had this thought run through your mind, do you think this would be something you’d try? I have to say that it hadn’t passed through my thoughts until today. 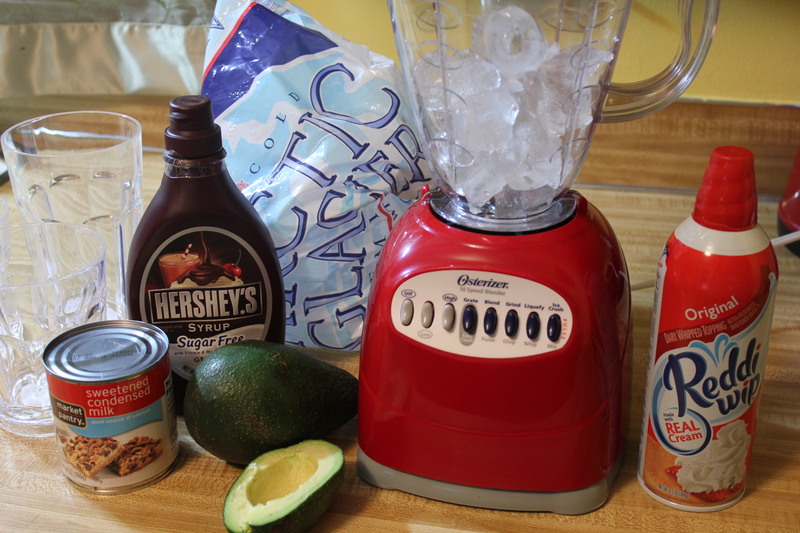 Blend together avocado, condensed milk and crushed ice until smooth. Add vanilla ice cream and blend again for 5 to 10 seconds. I added a bit of sugar to sweeten just a bit. This was a pleasant surprise! Add a little bit of whipped cream on top and some chocolate syrup to sweeten it up just enough.